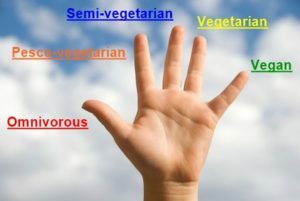 A randomised study looked at how effective five different diets were for weight-loss: vegan, vegetarian, pesco-vegetarian, semi-vegetarian and omnivorous diet. Do what did the study reveal? But what percentage of carbs? Was getting enough protein a problem for vegan/vegetarians? What were the participants’ diets like before the study? Were there any other concerns with the vegan diet? Sixty three subjects followed the diets for six months. These were people who were interested in weight loss, and a lot of them had tried everything before – from cabbage soup diets to fasting. The researchers involved in this study were also interested in looking at how to quantify the inflammatory potential of the diets. And so they developed a dietary inflammatory index based on large epidemiological studies that measured both diet and other measures of inflammation – things like C-reactive protein and Interleukin 6. They were thus able to quantify different components of the diet. At the two-month mark, the vegan group, pesco-vegetarian group, and the vegetarian group all had significant decreases in their inflammatory potentials. So their diets became less inflammatory over the course of that two-month time period. In terms of macronutrients, it looks like it’s the carbohydrates profile in heavy plant-based diets that improves anti-inflammatory responses, while high protein/fat and low-carb diets seem to do the opposite. The figures we are talking about are in the area of 70% of calories coming from carbohydrates, around 20% fat and 10% protein. The low carb diets, of course, had much higher amount of fats, saturated fats and protein. Not at all. Both groups still had ample protein (around 10% of calories). This is the upper end of healthy calories from protein, according to Professor T Colin Campbell. As soon as you tell someone that they’re going to be eating a higher carbohydrate diet, they get a little scared. They’ve been told that carbohydrates make you fat. So, two of the things that they focused on in this research were fibre intake and glycaemic index. But even though each group endeavoured to stick to these requirements, it was only the vegan group that came anywhere close to meeting recommended fibre intake (UK – 30 grams/day, US – 25 grams). US dietary guidelines state that saturated fat should really not be above 7% (around 15 grams) of daily calorie intake, if you are at risk for disease. The UK dietary guidelines state almost twice this for men (30 grams) and around 20 grams for women. And if you thought the vegan group would easily manage to stay below this, think again. While the vegan group were indeed the only group that met saturated fat recommendations, their intake was on the borderline of eating too much saturated fat. Their diets were “pretty dismal” in terms of the percentage of macronutrients. They were eating about 40% of their calories from fat, with 13-14% of that being saturated fat. Carbohydrates were only about 40%. The lead author of this research, Dr Brie Turner-McGrievy, considers many people transitioning to plant-based diets tend to put heavier reliance on more processed foods. And she acknowledges that if a person has eaten a hamburger for lunch every day, getting them to switch to a veggie burger is a sensible transition before they then progress to whole foods. She suggests that the next stage in transitioning to a plant-based diet is to focus on beans. That’s where one really starts to see a difference, when the protein sources are also always high in fibre. The fibre intake recommendations can then be satisfied very easily and in most cases well-exceeded. Antioxidant intake was increased, as were vitamins C and E.
Levels of vitamin B-12 and calcium – the usual ones that people think will suffer on a vegan diet – were not significantly different from those of the other four groups. In fact, at two months the vegan participants were consuming about 2.7 micrograms of B-12. And this was without considering the fact that all groups were on supplemental B-12. So they did not see a lot of differences in those nutrients that the media tend to scaremonger about. Two areas where vegans experienced a much greater increase were in vitamin B9 (folic acid) and potassium intake. Getting the right balance between sodium and potassium intake is one area of real concern for many people on standard diets. It is addressed easily by consuming sufficient leafy greens and other good potassium sources – things that the vegans were consuming in larger quantities than the other four groups. Dr Turner-McGrievy pointed out that the improvements seen on the vegan diet would be even greater on a whole food plant-based diet. The above study only went so far as to look at vegan diets – and there is never a guarantee with vegan diets that they will be significantly healthier than other diets, especially if they consist of processed foods that contain added oils, salt and sugar. Compared with the other four groups, the vegan group showed improvements in the following: sustained weight-loss, increased dietary intake of vitamins (C, E and folic acid), minerals (particularly potassium) and increased fibre. But all the evidence suggests that these and other factors improve even more with a WFPBD (whole food plant-based diet). For those who have not yet transitioned to a WFPBD, there are some wonderful surprises in store if and when they do so. And, unlike other diets, WFPB nutrition is a sustainable and rewarding way of eating that can last for the rest of one’s life. Moore WJ, McGrievy ME, Turner-McGrievy GM. Dietary adherence and acceptability of five different diets, including vegan and vegetarian diets, for weight loss: The New DIETs study. Eating Behaviors. 2015 Dec; 19:33-38. Turner-McGrievy GM, Davidson CR, Billings DL. Dietary intake, eating behaviours, and quality of life in women with Polycystic Ovary Syndrome who are trying to conceive. Hum Fert. 2015 Mar; 18(1):16-21. Turner-McGrievy GM, Davidson CR, Wingard EE, Wilcox S, Frongillo EA. Comparative effectiveness of plant-based diets for weight loss: A randomized controlled trial of five different diets. Nutr. 2015 Feb; 31(2): 350-358. Turner-McGrievy GM, Wirth MD, Shivappa N, Wingard EE, Fayad R, Wilcox S, Frongillo EA, Hébert J. Randomization to plant-based dietary approaches leads to larger short-term improvements in Dietary Inflammatory Index scores and macronutrient intake compared to diets that contain meat. Nutr Res. 2015 Feb; 35(2):97-106. Turner-McGrievy GM, Davidson CR, Wingard EE, Billings DL. Low glycemic index vegan or low calorie weight loss diets for women with Polycystic Ovary Syndrome: A Randomized Controlled Feasibility Study. Nutr Res. 2014 June; 34(6):552-8. Turner-McGrievy GM, Jenkins DJ, Barnard ND, Cohen J, Gloede L, Green AA. Decreases in dietary glycemic index are related to weight loss among individuals following therapeutic diets for type 2 diabetes. J Nutr. 2011 Aug; 141(8):1469-74. 46. Turner-McGrievy GM, Barnard ND, Scialli AR. A 2-Year Randomized Weight Loss Trial Comparing a Vegan Diet to a More Moderate Low-Fat Diet. Obesity. 2007; 15: 2276-81. Posted on 2nd March 2018 By wholefoodplantbaseddietPosted in Nutritional Research, Weight Loss, Whole Food Plant-Based DietTagged B12, B9, calcium and potassium in WFPB diet, Diets compared, Dr Brie Turner-McGrievy, E, sodium potassium balance, Vegan vs WFPB diets, Vitamin C, which diet is best?